Soy-based foodstuffs like veggie burgers and nutrition bars are a source of protein and generally considered “health foods” often eaten out of a belief they are good for you. Soyfoods also have a reputation for being produced in a more environmentally friendly or sustainable fashion than animal sources of protein. However, whether foods containing highly processed forms of soy protein are really good for people or the environment is brought into question by a Nov. 2010 report from the Cornucopia Institute, a Wisconsin-based non-profit claiming that non-organic soy protein is commonly extracted from the soybeans by literally bathing the beans in n-hexane, a chemical by-product of petroleum refining. Soybeans were originally introduced to U.S. farmers in the 1930s from Southeast Asia where soybeans have traditionally been treated with hot water to yield soy milk and tofu or else fermented to obtain products like soy sauce, miso and tempeh. Soybeans were initially grown in the United States to obtain soy cooking oil which was extracted mechanically (through pressure), and the protein rich residue was and is still used as animal feed. By the 1950s, soy oil was the most popular vegetable oil in the United States, though rapeseed oil (canola) later surpassed it in popularity. However, chemical extraction was applied to soybean processing in the latter half of the 20th century to derive the various protein derivatives now added to many human foods: soy protein isolate, soy protein concentrate, and textured soy protein. 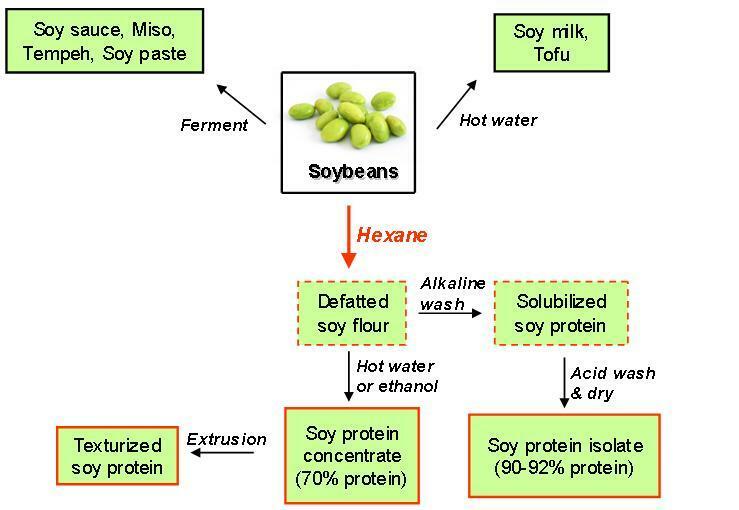 The first step in obtaining any of these is the chemical bath which extracts the soy oil, leaving behind “defatted” soy flour which undergoes further processing into the different forms of soy protein incorporated into foods (see diagram below). Hexane remains today the chemical of choice for oil extraction for not just soy but other vegetable oils too, like corn and safflower. However, any oils meeting USDA Organic standards, which prohibit processing with synthetic chemicals, are always extracted mechanically with pressure via an expeller, screw or ram press. The more traditional oils, like olive and coconut, are also often obtained through mechanical extraction, whether organic or not. According to Cornucopia’s food policy analyst Charlotte Vallaeys, the standard hexane bath is literally 50-60 percent n-hexane, and the rest is composed of other related petrochemicals – cyclohexane, methylcyclohexane and methypentanes. Hexane is a readily available component of gasoline used as an industrial solvent for cleaning and degreasing all sorts of items. As to why it continues to be applied to extracting soy protein when mechanically extracted organic soy protein has been available for many years, the answer is obvious: Hexane extraction is cheaper and the yield is greater. The U.S. Environmental Protection Agency classifies hexane as a neurotoxin affecting the nervous system of humans and lab animals, based on effects of chronic inhalation. Chronic workplace exposure increases risk for polyneuropathy, a neurological disorder characterized by muscle weakness, nerve damage and visual impairment. The agency cites no studies that have yet looked into the effect of oral exposure, and studies are also lacking to determine hexane’s carcinogenic potential except for one which linked brain tumors to workers exposed to hexane and other chemicals at a petrochemical plant. Hexane is also regarded as a hazardous air pollutant because it contributes to ground-level ozone, a component of smog. According to Cornucopia, 19 million pounds were released into the air in 2009 from the processing of soybeans and other grains. Furthermore, hexane is highly explosive and has injured or killed both plant workers and tanker truck drivers. The U.S. Food and Drug Administration (FDA) has not set any restriction on the maximum level of hexane allowed in soyfoods, nor are manufacturers required to measure residues in foods, so how much hexane humans could be exposed to through consumption of processed soyfoods is unknown. The European Union, however, adopted a directive in 2009 targeting residues of solvents used in food processing and set a hexane limit of 10 ppm (parts per million) for foods containing defatted soy protein products. In 2009, Cornucopia sent a sample each of soy meal and soy grits to an independent testing lab which detected hexane residues of 22 ppm and 14 ppm, respectively. Cornucopia has since petitioned the FDA to measure both soy foodstuffs and human tissues for hexane contamination, with particular focus on products made for infants and children because of the greater vulnerability of youngsters to environmental toxins. The FDA has yet to respond. According to Cornucopia, the more mainstream brands of infant soy formula (Enfamil, Similac and Nestle) rely on hexane-extracted soy protein, and the manufacturers offer no organic alternatives. At least three smaller companies do: Vermont Organics made by PBM Nutritionals, Earth’s Best from The Hain Celestial Group, and Baby’s Only from Nature’s One. Downloadable shopper’s guides are offered by Cornucopia which list popular brands of nutrition bars, veggie burgers and meat alternatives according to whether or not their soy ingredients are processed with hexane (www.cornucopia.org/2010/11/hexane-soy/ ). Twenty of the 44 nutrition bars inventoried, including Cliff Bars, Odwalla, and Genisoy, are processed with hexane, and the same is true for 17 out of 31 meat alternatives, including popular products made by Boca, Morningstar Farms, Gardenburger, and Yves Veggie Cuisine. A word of warning: It can be tricky to get the straight scoop from manufacturers of non-organic soyfoods on how the protein was extracted because most will have purchased it from one of the handful of corporate giants that actually do the extractions (e.g. Archer Daniels Midland or Solae). Soyfood makers can disingenuously skirt the issue by stating that their company does not use hexane. Cornucopia emphasizes the importance of scanning the ingredient list for non-organic soy protein ingredients or, better yet, looking for the USDA Organic seal. A product labeled “made with organic ingredients” can still contain up to 30 percent non-organic ingredients, and a “natural” label conveys nothing about how soybeans were processed. This entry was posted on Sunday, March 27th, 2011 at 11:27 am and is filed under diet, health, pollution, science, sustainable living, toxics. You can follow any responses to this entry through the RSS 2.0 feed. You can leave a response, or trackback from your own site. My rule of thumb is the higher the mole wt of the HCBN the more carcinogic it is so I would also be concerned about the other components you mention.and maybe on a PPB basis?? I just read this in the Santa Monica Daily Press. I’m vegan so let me first say — thank you. I had no idea that even those who supply soy products choose to be duplicitous. They don’t care that most people choose soy because of allergies, health ailments or other serious issues. I should have known better. After all, corporations are required to make profits rather than allowing their product to harm consumers or the environment. Based on what I read in this article, I will not buy Boca Burgers, Gardenburgers, Cliff Bars, Morningstar Farms, Yves Veggie Cuisine, or Odwalla bars — products I’ve regularly bought in the past — until I see the “UDSA Organic” seal on them. Ingesting a product that’s processed with a lethal oil compound is not a healthy alternative to eating animal protein. I don’t think most people know or would believe how food-related corporations can fatally damage our health in spite of what the individual does to lead a healthy, productive life or to feed our loved ones. I hope you’ll continue to monitor what these companies choose to do — if anything — going forward. Again, thank you. Likewise for me – no more Balance Bars, Kashi, or non-organic soy milk…geez, what are these companies thinking and why the HE__ isn’t the FDA regulating this??? I would like to print your blog entries in our local community newspaper. How can I contact you? K – what local community paper?